Last Updated: July 26, 2018 | Subscribe to our weekly newsletter! 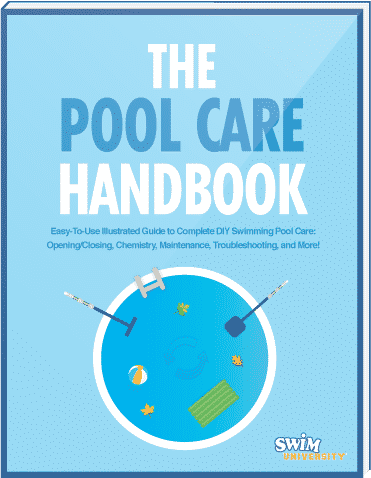 Having closed your pool for the season, you’re taking a break from your rigorous summer pool maintenance schedule. Whoa, don’t get too comfy there. You still need to take care of your pool during winter, especially the winter cover. (You did cover it, right?) Harsh weather can take a toll on the cover, and if you’re not careful, it will fail, letting all kinds of nasty stuff into your pool, making a mess you’ll have to clean up when you open it. Not to worry. To keep water from accumulating and damaging the cover, all you need is one small piece of equipment—a pool cover pump. But before you pick one up, make sure you know what features to look for so you can choose the one that will work best for you. 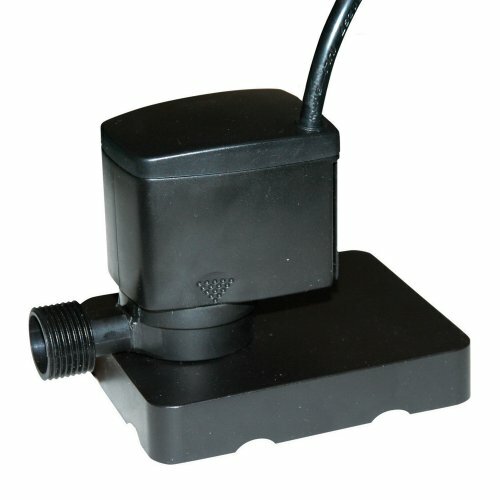 Why Do You Need a Pool Cover Pump? Your winter pool cover If you click this link and make a purchase, we earn a commission at no additional cost to you. keeps rain, melted snow, and debris like leaves and twigs out of your pool when it’s closed. But unfortunately, all those things don’t magically bounce off the cover. (Hmm … trampoline as pool cover? Nah.) They have to go somewhere, and that usually means on top of your cover. As water accumulates and becomes heavier, it will begin to gather in the center of the cover. Just one inch of rain on a square foot weighs 5.2 pounds. If your cover has a surface of approximately 280 square feet (just a little under a 12 by 24 foot pool), that’s 1,456 pounds of water on your pool cover after just an inch of rain. Leaving three-quarters of a ton of water sitting on your pool cover will speed up the need for replacement. You also have to plan for opening your pool later. That standing water will have to come off sometime, which means you’ll either have to do it yourself or pay someone else to take care of it if it’s too big a job. That’s if your winter pool cover has held up under several hundred pounds of water for a few months. 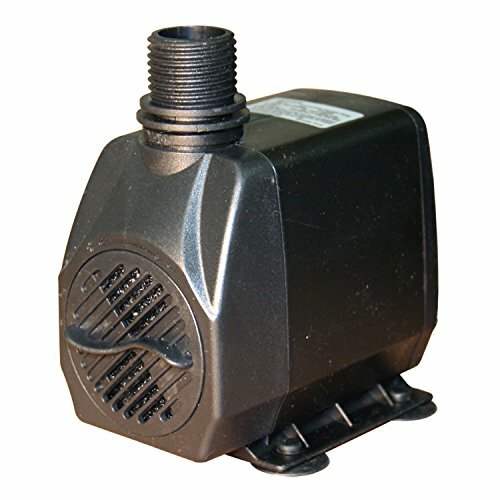 What Does a Pool Cover Pump Do? First, it keeps that water and small debris from building up on the cover by pumping it out and into the yard, or wherever you direct it. Second, it keeps your pool from overflowing from rain and melted snow that seeps in past the cover. No pool cover is airtight. A note about snow: A pool cover pump removes water, not snow. You don’t want to leave snow sitting on your cover and wait for it to melt because it may turn to ice instead, and then you’ll have an even bigger problem. 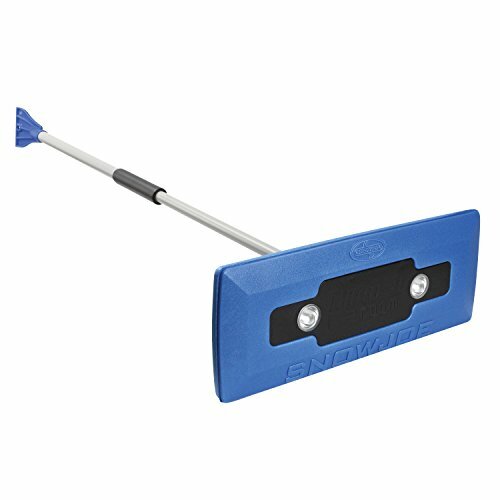 Use a snow removal tool with a non-abrasive foam head that won’t tear the pool cover If you click this link and make a purchase, we earn a commission at no additional cost to you. to gently push snow off your cover to keep it from getting too heavy and causing any damage. No, we’re not talking about cars here. But one of those names may not quite mean what you think it means. If you choose a manual pump, you’re not going to have to stand outside with a hose on your pool cover, pumping a lever up and down to remove the water yourself. That would be a great workout, but it’s not necessary. Instead, this simply means you’ll have to keep an eye on your cover, and when you see water beginning to accumulate, you’ll have to manually turn the pump on. Forget to check for a couple of days, and you could have a little trouble on your hands. An automatic pool cover pump is exactly what it sounds like. Left in the center of your cover, it will automatically turn on and begin working when it detects that water has reached a certain level. You’ll still want to keep an eye on things to ensure it’s working properly, but you can rest a little easier. If you can splurge, an automatic cover pump is a worthwhile investment. If you’re saving, a manual cover pump will still get the job done, just with a little more effort on your part. 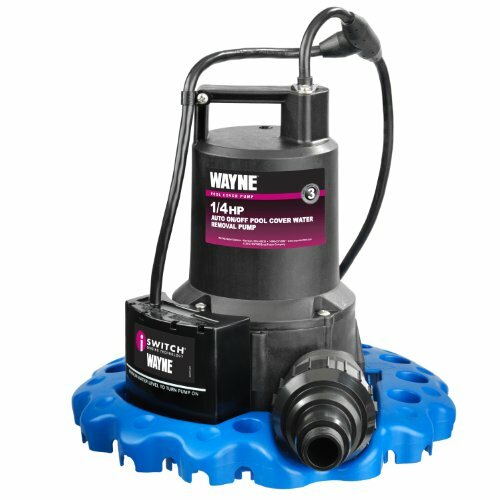 If you really want to be as hands off as possible, the Wayne WAPC250 automatic pool cover pump is the way to go. The pump automatically turns on when water reaches a certain level around the entirely submersible machine. It has a filter to keep debris from clogging and tipping over the pump, so you can leave it to its own water-removing devices without worrying. The pump itself can pump up to 3,000 gallons an hour If you click this link and make a purchase, we earn a commission at no additional cost to you. with just a 1.25-inch drain hose. It has a 25-foot power cord and automatic freeze protection technology to protect the motor if you accidentally leave it out in freezing conditions. 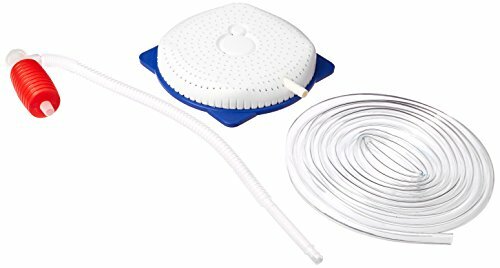 The kit even includes a 25-foot rope to help position the pump on the pool cover. 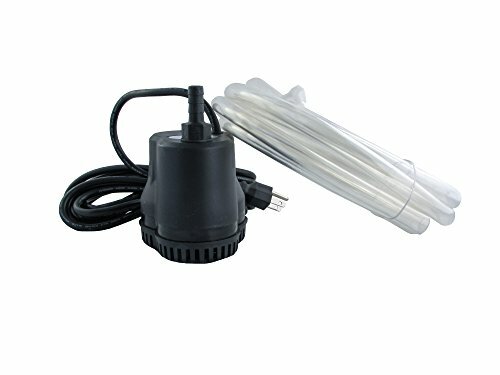 Slightly less powerful than the Wayne pump, the submersible pool cover pump from Little Giant can remove up to 1,745 gallons of water an hour. This automatic version turns on when water reaches two inches If you click this link and make a purchase, we earn a commission at no additional cost to you. around the machine, and turns off on its own when water is at a more manageable level. The Little Giant attaches to a standard garden hose and has a removable intake screen for simple cleaning and maintenance. It’s lightweight—only 13 pounds—so it’s not that much of a strain on your pool cover—or your back—either. So you don’t want to do too much work, but you don’t want to splurge that much on a pump. 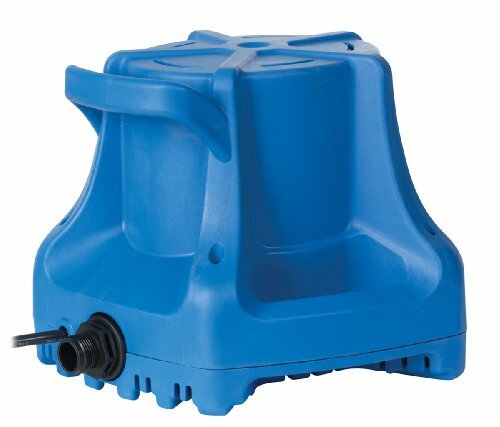 The Ocean Blue Automatic Electric winter pool cover pump might be just what you’re looking for. It’s reasonably priced, fully submersible, and automatically removes water within 1/8 of an inch. Like the Little Giant and the Wayne pumps, it comes with a 25-foot cord and an adapter for a standard garden hose. It’s a small motor, so it can only handle about 350 gallons an hour. But if you don’t have to stand outside and watch it go, does it really matter? 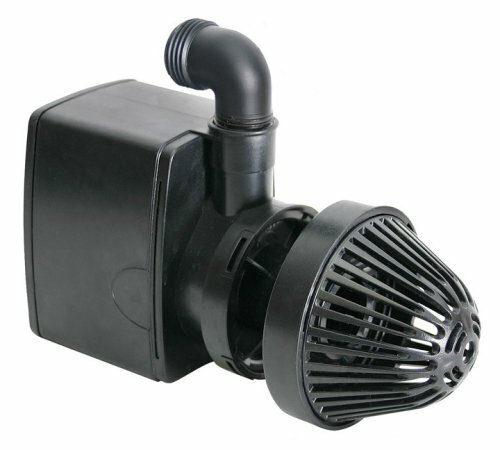 If you’d prefer to have a little more control over your water removal, the Little Giant pool cover pump is a relatively inexpensive yet durable If you click this link and make a purchase, we earn a commission at no additional cost to you. option. Simply attach a 0.75-inch garden hose, plug it in, and start pumping. The Little Giant has an intake screen to prevent debris from clogging up your hose. Pumping at about 550 gallons an hour, it’ll take you a little longer to get rid of the standing water. But if you keep a regular maintenance schedule, it’ll still make quick work of standing water. The motor itself is entirely submersible, so you don’t need to worry about whether or not it’s big enough to tackle the job. 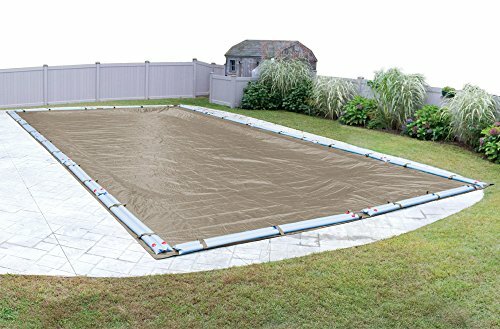 Got a lightweight pool cover? At just 3.6 pounds, the cover pump from Fibropool doesn’t have much heft to it, but it’s budget-friendly and pumps water at about 600 gallons an hour If you click this link and make a purchase, we earn a commission at no additional cost to you. . Plus, you don’t need to give up your garden hose for this job—the machine comes with its own 16-foot drain hose. Speaking of a shorter drain hose, make sure your pool is narrow enough or close enough to a power outlet before considering this one. Like the hose, the pump only has a 16-foot cord. Tossing out up to 350 gallons of water an hour, the Dredger Jr. cover pump from Blue Wave works wonderfully if you’re looking for an inexpensive and lightweight If you click this link and make a purchase, we earn a commission at no additional cost to you. pump. It’s fully submersible, but requires an operator (that’s you) to turn it on and off. Still, it can remove water up to 1/8 of an inch deep, which means a sunny day can take care of the rest of that standing water. The kit includes an adaptor for a standard garden hose, plus the cord for the pump is 25 feet long. What weighs just three pounds and pumps up to 500 gallons an hour? You guessed it! It’s the Splash Pools Universal cover pump. It comes with an standard garden hose adapter and plugs into a standard electrical outlet. The pump itself is manual, but it’s an economical option If you click this link and make a purchase, we earn a commission at no additional cost to you. if you’re watching your pool maintenance budget. So your pool isn’t anywhere near an outlet? That’s perfectly fine. The pool cover drain from Blue Wave removes water without electricity If you click this link and make a purchase, we earn a commission at no additional cost to you. . Instead, it relies on the power of your hands. If your kids are a little too energetic, you might be able to trick them into encourage them to “play” with the pool pump. The Blue Wave Drain is a complete drain, pump, and siphon setup that comes with a 13-foot hose. It’s also extremely inexpensive, so if your budget is super limited, this is a great pump alternative. Whether you go with manual or automatic, adding a pool cover pump to your maintenance arsenal can save you a lot of energy, money, and time. Not to mention the peace of mind you’ll get knowing your pool and your winter cover are protected during the harsh weather months. Plus, used regularly during the off-season, a pump means less cleaning for you when you open your pool. And that means you’ll be able to get back to the fun that much sooner. Your winter pool cover is meant to protect your swimming pool, but are you doing anything to protect your pool cover? Here are 10 tips to help this winter. Keep your pool heater safe from vermin by learning how to keep mice and rodents out of your pool heater so it will warm your water when you need it. Have you ever considered a pool enclosure for your favorite swimming hole? If not check out this ultimate guide to pool enclosures perfect for your pool. Taking care of your pool doesn't end when you put the cover on. Maintain your pool during the winter, and make next season's opening a lot easier. Got snow on your pool cover? With this quick tutorial, you'll learn how to remove snow from a pool cover properly and efficiently with some added tips.